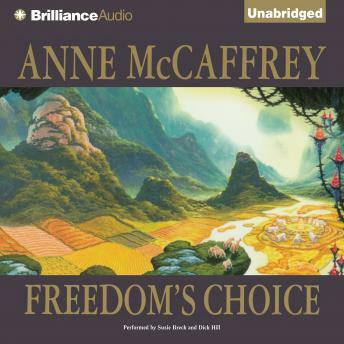 Anne McCaffrey captured the interest and hearts of many with Freedom's Landing as Catteni slaves unexpectedly became settlers establishing a new colony on Botany, presumably an uninhabited M-type planet. In Freedom's Choice the saga progresses to an extraordinary level. The shipments of Catteni slaves continue, but they find that they are enjoyably reinventing the creature comforts of home, and searching for the origin of the Farmers who were the original occupants of Botany, all under the keen eyes of two very different observers. When scouts for the Emassi come to retrieve Zainal, shanghaied in the original shipment of slaves, Botany changes irrevocably. Listeners will delight in this continued adventure of survival, romance, and ingenuity.